Food speaks to people. People of every race and nationality. There is just something about FOOD that can bring people together…and bring comfort at the same time. Food is my love language. It’s how I show love to others…and it’s how others show love to me. After the birth of Ruth Ann, we received an abundant outpouring of love from friends and family in the form of food. At 3 weeks in, I still hadn’t touched ANY of my freezer meals. But, this wasn’t always the case. After one of my births, we were at a different place in life and hardly received anything – I felt all alone and on my own. -No one ever brings me anything. I’m issuing a mandate to you all – let’s see how many people this year that we can bless with food. Yeah, you heard me…food. Everyone needs food. It’s a universal need and mostly a universal love. Why might you want to send a meal to someone? There are tons of reasons! You won’t really need to LOOK for reasons to send food-they’ll just come to you. I think people with allergies may need love the most. Why? Because people are scared to send them food. Allergies are scary things, man. I understand the intimidation. I have several friends with allergies, and it’s hard for me to sometimes think of sending them food – but everyone else is thinking the same thing! Don’t leave those with allergies out…think about them, consider what they CAN eat, and deliver that. Even if it means you just send them some fruit. I hardly ever drop off a conventional meal, unless it’s requested. I like to deliver breakfast foods! Don’t let the fact that you’re not local, keep you from sending meals to someone. I recently did a video with you guys about meals you can send to others even when you don’t live close. My sister, Jamey, had a baby and she lives in Georgia…which isn’t close enough to Virginia for me to take her a meal. So, I sent her a couple of gift cards for meals. I want her to know that I love her and want to help her needs, even if I can’t be there in person. For some other GREAT ideas for sending meals, out of town, check out my video below. Now, go forth this year and bless others with food. Look for ways to serve others with brownies, soups, and muffins. 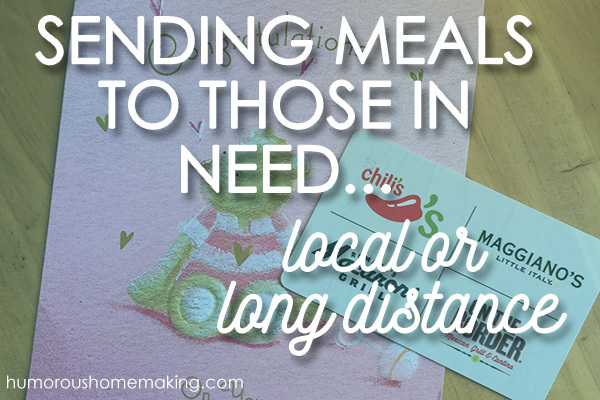 How do you send meals to others? I took a hot meal with a meat, sides and a dessert to an overwhelmed friend tonight. No special reason – she just has a demanding job and lots of home responsibilities and needs a break. It makes me happy to do things for her and I know she enjoys a quiet evening with a hot meal. You are so right, Stacy! Food can be SUCH a blessing to others and sometimes I totally overthink it. I love your point about it not always needing to be conventional – maybe we drop off muffins on a weekend morning or kid friendly snacks to help our friend who is stressed about a long road trip coming up. I need to remember that even the little things are such a blessing to people!! Great topic!! Oh, I love the snacks for trips idea!!!! I usually send water bottles and disposable tableware too. Who wants to do dishes at times such as these? Those are really great additions!!! I love this post, Stacy. Food is my love language, too! I’m usually on the giving end, but really appreciate being on the receiving end, too. A couple of other ideas–provide meals occasionally for elderly or single people; they often don’t eat as well as they should since it’s sometimes “too much trouble” to cook for one person (or have them over for fellowship, too!). Send care packages to missionaries you know or that your church supports. My son’s family loves to get goodies from the U.S. that they cannot get where they are. The postage sometimes costs more than the food in the box, but it’s worth it (remove as much packaging as you can to cut down on the weight). Another idea for missionary children is to send a birthday box that includes decorated paper plates, napkins, balloons, cake mix, candles, etc. Remember it takes about 3 – 4 weeks if you mail it via “slow boat.” Food gifts truly are a wonderful way to bless and encourage others. Miranda, those are GREAT suggestions!!! Thank you so much for adding them! When my daughter was born, a friend from work brought us the makings for tacos. The meat was cooked, each ingredient was in its own container (lettuce, cheese, etc). This was so handy as we could eat it when we were ready. And most people LOVE tacos! Great idea! Stacy!! I am with you!! My husband kind of makes fun of me but, whenever there is a death, and birth or a surgery, I am always making something and dropping it off. I celebrate with food, I console with food, I am all about it! After all, it is something ALL of us have to have. I am blessed with a wonderful church community now, but that wasn’t always true for me either. I wish I had had this when I had my 3 kids!! My church has several smaller groups that organize meals for members who have surgery, babies, death in the family, hospitalizations, etc. It really does bless someone. I had surgery a couple years ago, and these folks delivered a hot meal for me and my family every other day for dinner for 3 weeks. It was the most wonderful help and treasure for me to not have to worry about feeding my little ones and husband. And bringing snacks to a new Mom is also great. She may not take the time to actually sit down and eat, but some snacks she can keep near her rocker with baby, well, that’s a gift too!! Oh yes, we love snacks here! It’s a big blessing when those are also included! I love to send meals to those for the various reasons listed. We have also been the ones that have been blessed with many meals from our church family and friends. We have been the giver and the receiver and it is pure joy. I encourage everyone to try it at least once-it is amazing! I am also going to use these different suggestions on meals to take. Thank you. Yes, try it at least once! If you hate it, you don’t have to do it again. Ha ha! 🙂 But, you’ll love it so much you won’t look back! I love this post, Stacy! I couldn’t agree more. I just moved to a new state 3 weeks ago, my husband deployed a week later, I don’t know anyone, and I’m pregnant with my 5th child and all I can think is, I need to make friends fast so someone will bring me a meal once this baby is born (in 7 weeks). Ha! It is such a tremendous blessing to receive a meal during hectic, and stressful times in life. Anything from scones and tea, to granola, to full meals with salad and dessert are always a blessing. And as much as I love to receive a meal, I love to give them. I bring them frequently to new mommas (including repeat mommas), family deaths, sicknesses/surgeries, and new neighbors or friends who’ve moved. And I agree with sending gifts from afar – I’ve sent restaurant gift cards so friends can get take-out or, for my sisters, I just send money and tell them to order pizza for their family. In all my years of giving meals I’ve never heard anything except immense gratitude for meals that I’ve delivered so I’m with you in encouraging others to get creative and give it a try. I have given friends in the hospital drinks, and snacks gifts. The family who is with the person in the hospital doesn’t get food at all from the hospital, they have to find change for the vending machines or go to the cafeteria. Hospital vending machines are so expensive. I like to gift those in the hospital with bottled water and snack crackers and mini cereal cups etc, maybe some fresh fruit too. Anything that will help tide them over for the next meal. That’s a great idea, Wendy!!! Those in the hospital need lovin’ care too! 🙂 I loved it when my MIL would bring me goodies in the hospital with each child. I would love for you to share what were some of the best meals you received and how they were packaged. I would like to give food to people in need but feel inadequate. If I had a specific menu and recipe that was universally liked I would feel better equipped to give. My computer locked up so I’m not sure if you mentioned it or not since I didn’t finish the video…but I love your ideas. My son’s family lives in Florida, my sister’s all in Texas and I am in Pennsylvania. I never thought of it that way, but believe my language of love is also food. I am always sending baked goods, breads or home CANNED goods. I use a pressure canner and make canned meals. Love to can soups, veggies, stews, sauces, pickles, and of course jams and jellies. Believe it or not, I’ve sent lot of jar through the mail with only one or two breaks. My daughter in law is due again in August. Will have to make a mixed box: gift cards, goodies and canned goods. What a great idea. Thanks again as usual. That’s great to know about mailing jars! I never thought of that! Such a great post, Stacy! I’m inspired. I think I’ll send my MIL a gift card for mother’s day as she now lives in Montana. Thank you! I love that you mentioned allergies. My husband has a PLETHORA of allergies (Gluten, corn, soy, nuts, seafood, most fruits…). Even his own mom isn’t sure what to buy or cook him when we visit, and has to ask me what is and is not okay. And you know? That’s OK! We know not everyone will remember what he can and cannot have, and we are MORE than happy to give you the lowdown if you ask- because asking what he can have shows us you care enough to do that extra step to bring us food in a time of need which means SO much. With our first child, I don’t believe a single person brought a meal to us. Which was weird because that was when my husband only had a fraction of the allergies he has now. The second birth, we were blessed to have a couple of sweet friends from church bring meals. They asked beforehand what *everyone* could in the family could have so my husband wouldn’t be on his own for meals and it meant so much. Ironically, it meant that both people brought almost the exact same meal (rotisserie chicken, mashed potatoes, and a veggie). but we didn’t have to cook every meal, and my husband even had leftover food for a quick grab lunch to bring to work. For our family, BECAUSE of the allergies, I make almost everything from scratch (due to necessity). So if anything, we appreciate it even more because it meant I didn’t have to be up and making food more than neccesary! Loni, thank you for chiming in on this subject. I think so many people are scared to help those with allergies, but allergy people need food love too! 🙂 Send veggies! Send fruit! Send love. I had bariatric surgery just over a year ago and made up a boatload of freezer meals for my hubby and son knowing that I wouldn’t be up to cooking for a few weeks after my 3 day stay. I’m an Admin in an AMAZING FB group for bariatric patients and last Christmas, another member posted that she was struggling with finances – bills, etc., but was also OUT of food as well as ideas for continuing to follow the bariatric diet. Several other Admins decided to send her Care Packages so I decided to WAIT a month or 2 and then send what I’d gathered. She was very appreciative! Oh yes! Very smart! I find that I try to save my freezer meals for a bit AFTER I get home because that’s really when it gets crazy. Thanks for sharing your experience, Bambi! 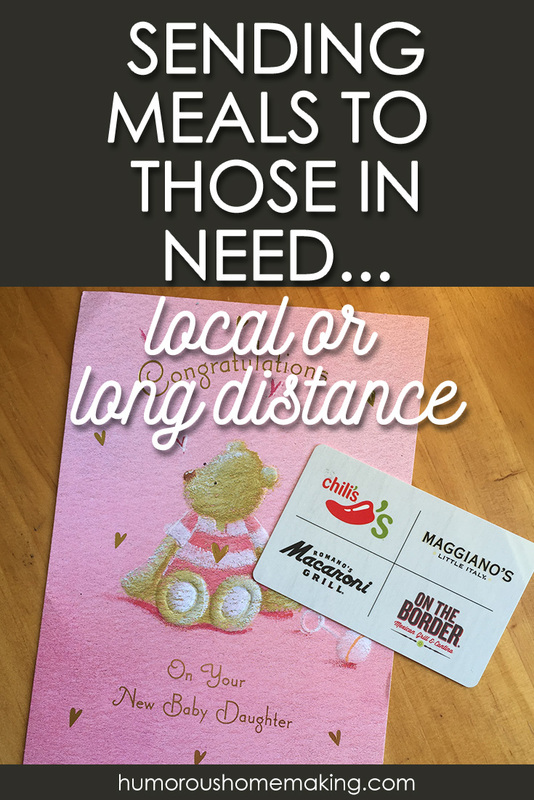 We use TakeThemAMeal.com at our church to send meals when little ones are born, when someone is grieving, or when someone has a medical issue. It is so easy to schedule and organize it this way and a bonus is you sign up with what you are bringing so no one gets 3 lasagnas when they are allergic to gluten. Not having to think about dinner when you are wiped out with a new baby or trying to plan a funeral, or care for someone who has just had surgery is such a blessing!! I have heard great things about that website!